Granger renovated approximately 151,000 SF of the Arts and Sciences Building (A&S) to increase science classrooms and laboratory space. These renovations, completed floor by floor as the rest of the building remained occupied, created nine additional classrooms and 10 additional science labs. The main level features an eye-popping lobby with floor-to-ceiling video display screens and a learning commons -- a large open study space decorated with modern furniture, vibrant colors and walls that can function as white boards. Other features include student-centered commons areas on every floor, multimedia centers, state-of-the-art smart boards and projection systems and hundreds of tables/desks/chairs where students can plug in their technology devices to work alone or connect with other interactive devices for group study. Renovations were also be made to approximately 79,000 SF of the first and second floor of the Gannon Building (GB) to increase space and improve student services. The second floor features a new One-Stop Center for student admissions, enrollment, registration, academic advising, counseling and other student functions in order to improve effeciencies and effectiveness for serving students. 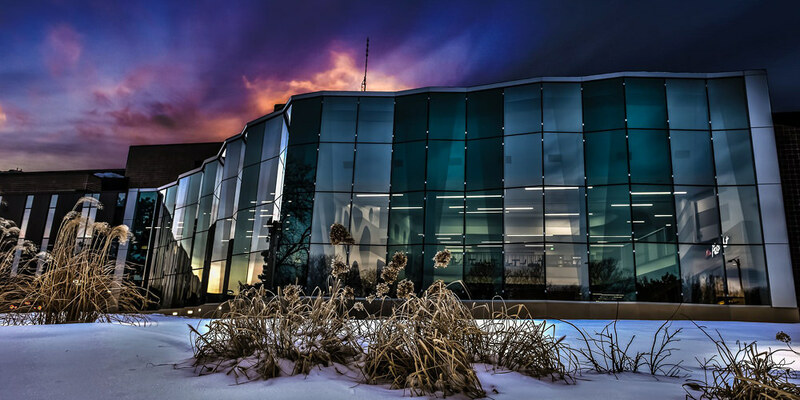 The Gannon Building project also involved the conversion of a natatorium into a student commons and food court area on the main floor and improvements to the perimeter including a faceted glass wall that winds along the building’s eastern face. All work took place while the building remained occupied.